Gray hair, touched up hair or no hair – we welcome you all if you are fifty or over. Come meet with us on the Second Friday of each month from September through May, for a covered dish lunch contributed by members to be shared. We start around 11:30 a.m. The Knights of Columbus (Council no. 14122) is a lay organization of men consecrated to Our Lady and committed to exemplify charity, unity, fraternity, patriotism, and the defense of the priesthood. Meetings are held on the 1st and 3rd Tuesdays each month in the Fellowship Hall. The Knights of Columbus is the leading organization of Catholic laymen. Our St. Stephen the Martyr council embraces the order’s values of charity, unity, fraternity and patriotism. We believe that a man is defined by his actions as a follower of God, and as a leader in our Church and community. It is through five key areas of service - faith, community, family, youth, and fellowship, that we work at making a difference. Are you interested in meeting other Catholics, ages 20-35 years of age, in your faith journey in a social/spiritual setting? Young Adult Ministry (YAM) is the organization for you. 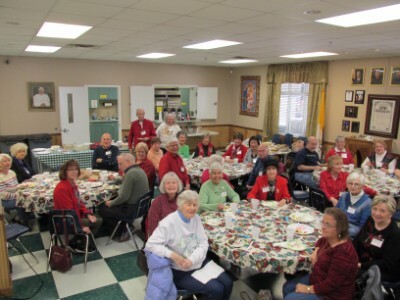 This group is a Catholic organization that meets bi-monthly with other local Catholic Churches such as St. Lawrence, St. John Neumann and St. Marguerite (to name a few). We attend evening Mass and ROOF (Rooted in Our Faith) discussion at a local restaurant, among other activities. We serve coffee and donuts after the 8:30 Mass each Sunday so parishioners and neighbors can meet and develop friendships. There is no better feeling than when a parent comes over to you saying that their child loves Sunday mornings for their donut. It is easy to get them to love the Church when they want to come. Set up and clean-up is a snap. Members serve one month at a time. Come join us. Members of the Parish Picnic Committee work diligently to bring the community of St. Stephens a fun filled day of fellowship and community in our own back yard. Several areas make up this Committee (formerly the Fall Festival Committee). Below is a list of the events that help bring together St. Stephen’s Parish Picnic every year – BBQ Food, Desserts, Musical Entertainment, Children's Games, Children's Crafts, Advertising, Sponsorship Fundraising and Set-up & Breakdown. We are looking for volunteers to serve on the Planning Committee or working the day of the picnic. Next Parishioner Picnic is Saturday September 29, 2018. If you love fresh air, sunshine, and playing in the dirt, this ministry is for you! The exercise is a great gift for your body and your soul. Our mission is to care for the gardens at the church and rectory. We have monthly garden parties on Saturday mornings during Spring, Summer and Fall. If you prefer independent work, we offer that as well by assigning you a specific area to care for. All hands are welcome, and this is great family fun! Volunteers learn about the calendar of events through email and phone calls, so please provide email when signing up. Because the parish does not employ maintenance personnel, we rely on volunteers to assist us in accomplishing certain tasks around the church. Some of the jobs take very little time, just a little muscle. This could be anything from hanging something on the walls, tightening screws, replacing the letters on the marquee, to light touch up work with a paint brush. All materials needed are provided. This ministry is available to any parishioner in need of assistance while experiencing sickness, hospitalization, or death of a family member. We need volunteers who are willing to assist in any way. Our library shelves are filled with donated books, videos and DVDs. We need help in sorting, cataloging and shelving these donations. We have a good start but as the donations continue to come in, we need assistance with the organization and labeling. You can decide how much time you can give. You can take home books to label and categorize. Any help you can give is much appreciated. It is a special privilege and responsibility to care for the babies in our church family. It is our goal to make the nursery a safe and inviting place for children 3 years old and under. The nursery is open to allow parents and guardians to attend Mass. This service is greatly appreciated. The volunteer commitment is one service every other month. The nursery is staffed with at least two volunteers at all times. Persons desiring to work with children must complete a background check. Also, a handbook is provided to you to aid you in becoming CPR certified. Volunteers, ages 12 to 112, are needed. This is a great opportunity for you to share God’s love. Office volunteers assist the office staff by answering phones, preparing mailings, and performing other tasks needed to help keep the office running smoothly and efficiently. Special Events Coverage is designed to be extended to individuals and/or organizations (either profit or non-profit) that hold special or non-parish events on parish facilities. Such as private birthday partys, anniversary or wedding receptions.